The 40 foot fishing vessel Full Circle sank in the harbor at New Bedford, Massachusetts. A boom was placed around the vessel divers were requested. The divers were able to attach straps around the hull and the Full Circle was raised later the same day. The cause of the sinking was not known, but the vessel had a history of sinking. The vessel had sat idle since it sank on September 22, 2011 in the same location. The sinking was caused by a leak around the propeller flooding the hull. The vessel was raised and it’s fuel tanks were pumped out. The vessel was to be scheduled to be sold later this week. The Coast Guard is conducting an investigation into the sinking. 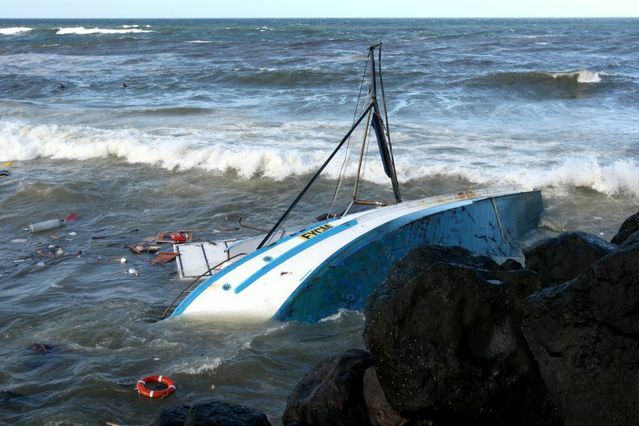 The 16 meter long trawler Toni Kylie capsized and went aground off Tweeds Head, Australia. The Toni Kylie had crossed over the Tweeds River Bar when the vessel lost control and went broadside to the waves. The trawler capsized and drifted back towards the harbour. The two crew on board remained on board until the vessel was pushed against the rock wall. The men jumped into the water and were able to make it ashore aided by local surfers. One man suffered a broken arm and was taken to hospital. Later that day, a strong swell help breakup the Toni Kylie spilling debris and diesel fuel. Authorities state there is no possibility of salvage. The fishing vessel CM 99659TS sank in the Gulf of Thailand. The vessel with 10 crew on board was proceeding to Banana Island to fish for squid when it struck a submerged wreck. The fishing vessel quickly filled with water and sank. The crew held onto buoys in the sea until being spotted. Six crewmen were rescued with another four reported missing.